Next Showcase: SHOWCASE!! The Martello Bray at 9pm on 22nd March 2019 - join us then. The Hitmen Trio are a band who do things a little differently. And it’s this difference that sets them apart. Since 2012 the Hitmen Trio have been gracing stages big and small nationwide in Ireland and abroad. Initially playing at small boutique weddings and parties within a few years they developed the sound to fill ballrooms and festivals. Roly & Romain undertook a HDIP in music in 2012, started jamming together and the blend was instantaneous, a band was set up and gigs were booked! Jonny, with his rare multi-instrumentalism was the obvious choice to integrate into the band to complete the Trio and it’s been full steam ahead ever since. 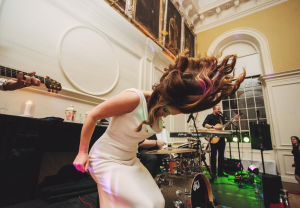 Using acoustic instruments the sound created is impressively warm and dynamic, the songs and arrangements are expertly crafted and the energy emitted on the dance-floor has been the focal point of hundreds of weddings and functions to those in the know. Get in touch to book your event. 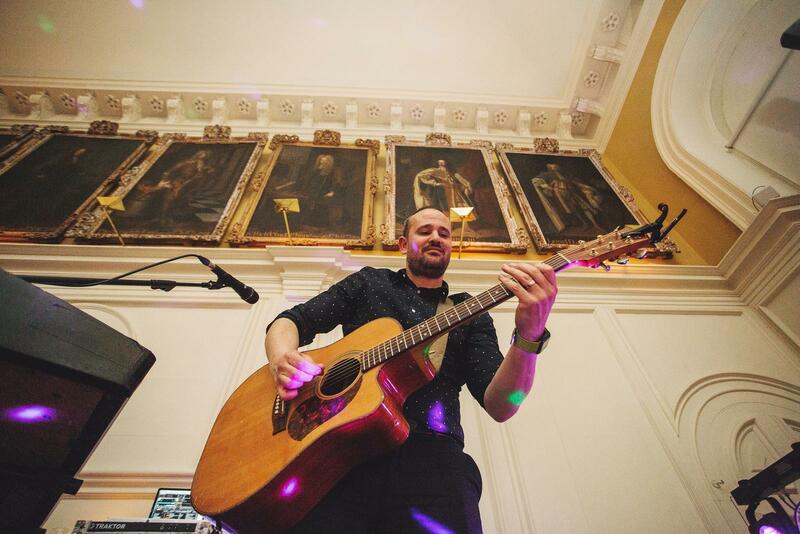 A born performer and musician Roly loves all aspects of the music business, from the organisation of the band logistics to dealing with excited brides and grooms with the wedding planning. Roly's versatility and professionalism come in very useful whether organising ceremony music or piano performance (yes, he plays piano at ceremonies and receptions) and his true passion for music can be seen when performing with the Hitmen Trio using his signature rhythm style guitar and vocals. He thrives on the energy and fun derived from being in a great wedding receptions band. 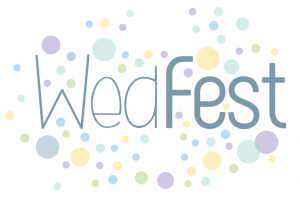 Roly got married in October 2012 so has been through the process most couples reading this are going through now- feel free to ask him for advice (not on marriage itself, just the organisation of the party)! Strange Fact: Roly is training for a half Ironman this year and is determined to be in the best shape of his life! Multi instrumentalist and performer Jonny Warren brings it all the table in true Hitmen style. 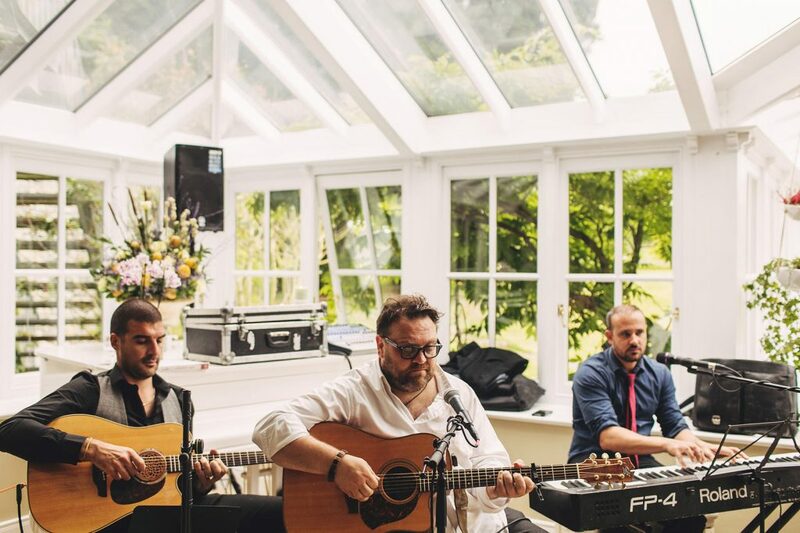 Jonny has a wealth of experience in weddings and functions and original music in 15 years in the business. His versatility is crucial as his is energy and unique character for the drums and vocals. His personality is down to earth and laid back, he enjoys talking personally to each couple and is a great focal point for the Trio. ....We don't know anyone who knows more songs than Jonny! I am originally from Bordeaux in France but am settled in Dublin’s fair city (be jaysus) and teach and perform music here. I play lead acoustic guitar in the band. I have a passion for arranging songs, it’s my thing, and you will see or/and hear my invisible ‘Roman’ stamp on many a solo, lick and riff within our set. "J’adore!" our sound in the Hitmen Trio - even though we play cover songs, we choose only the good ones and the best not so good ones, and they are all so tastefully done with exotic twists and turns and unexpected mash ups. Are you looking for a wedding band with a real difference? 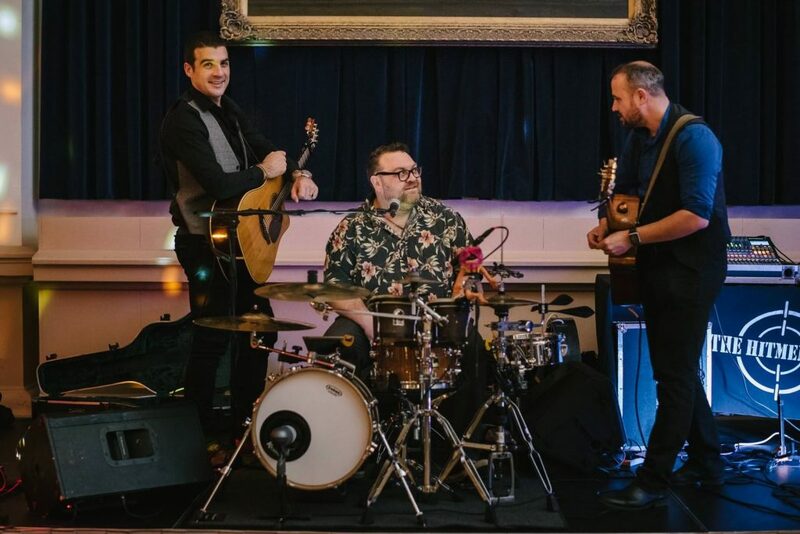 The Hitmen Trio use only amplified acoustic instruments, original arrangements of great, instantly recognisable songs and harmony vocals to create an upbeat yet intimate sound for your celebration. 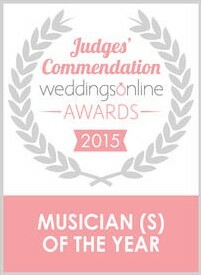 Multiple award winners from Hot Press/Weddings Online and Mrs2be, with our musicianship you are in safe hands. 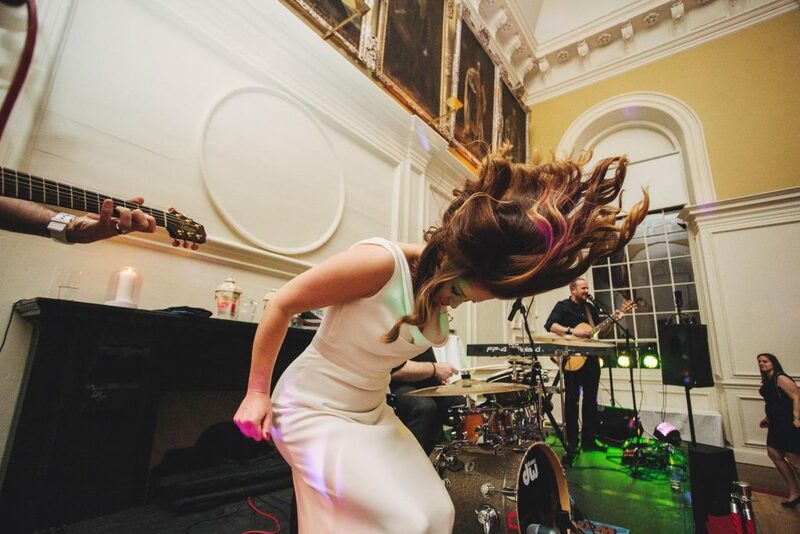 Live music is integral to having a great time with friends, family and guests and it is vital to book a band with the experience, flexibility and energy to allow the night to be unforgettable for you and your guests. Perfect for any wedding large or small and we delight in surprising and delighting and going the extra mile, please take a good look at our website and testimonials page (over 200 testimonials). 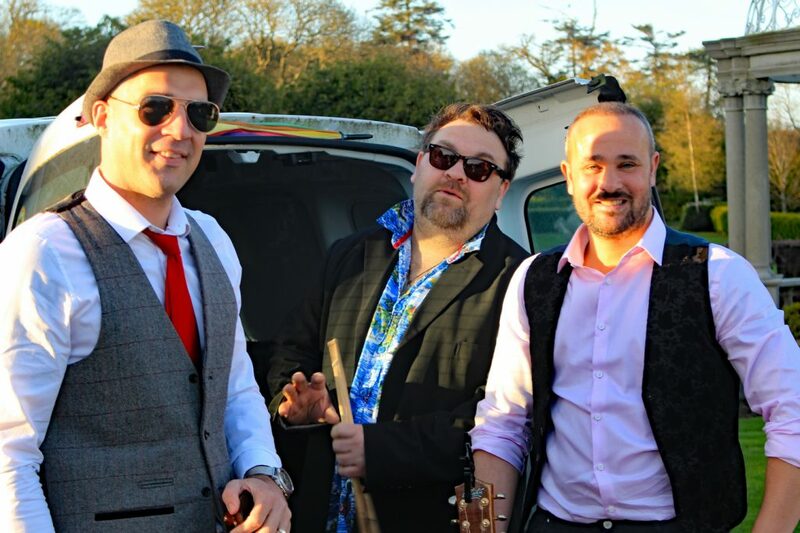 The Hitmen Trio are multi instrumentalists with Romain augmenting his phenomenal acoustic guitar with jazz and blues and classical for the drinks reception and ceremonies. 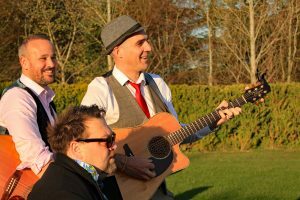 Roly is a classically trained pianist and it features heavily in the drinks reception and ceremonies along with his guitar and vocals. Jonny is a strong performer with his guitar and vocals as well as being a drumming sensation and there are not too many drummers with lead vocals! 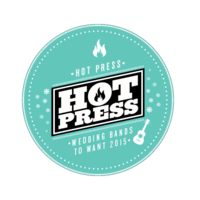 2014 and 2015 2016 and 2017 Hot Press Wedding bands to Want. 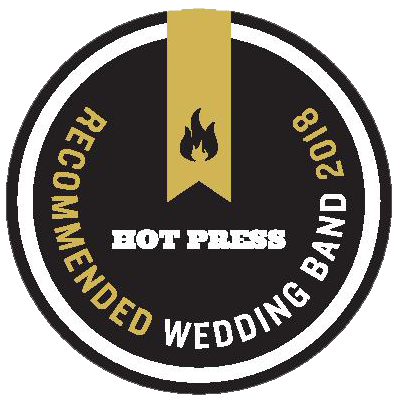 for WOL Best Wedding Band 2014 and Musicians of 2015. Playing centre stage at Bray for the return of Katy Taylor after the Olympics 2012, great scenes. 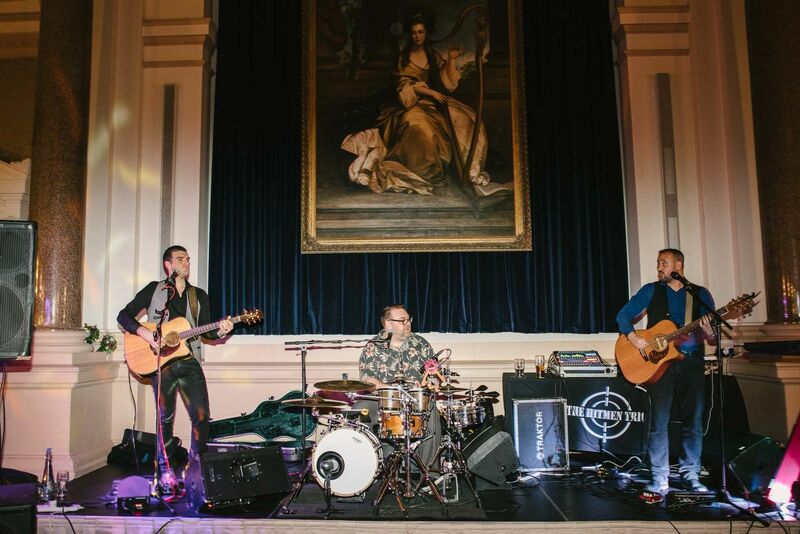 Playing for Leinster Rugby in the Mansion House, Jameson events all over Europe and so many weddings in Ireland meeting wonderful people. Why should I book the Hitmen Trio? Musicality and originality combined with hits from the 60′, 70’s, 80’s, 90’s, 00’s to present day means there is something for everyone to enjoy…and it’s NOT the usual cheesy predictable fare. 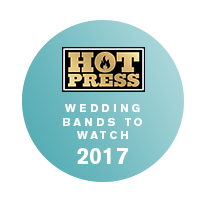 Expect creative expression, passion and energy, unbelievable mash-ups, and a great range of music and styles from a quality alternative wedding band choice. Our fantastic arrangements ensure all your guests will have an amazing night. Expect the dance floor to be filled and grooving with everyone from the young to the young at heart! We will work with you and your requests for the music on your special day, just give us at least 3 weeks notice to work on a specific request. "The dance floor was full and every age group was giving it all they got all night"
"The guys were amazing, they had everyone dancing non stop. They playes our first dance song and it was beautiful. It was like a festival. At one point I had to change my shirt nexus I'd been dancing so long. Amazing would highly recommend. Worth every penny. Apart from getting married they were the highlight of the day"
"The Hitmen Trio were an amazing band to have at our wedding and really made the occasion so special for us. They played our ceremony music, along with the reception and dj. They were so professional all the way through and had absolutely everyone dancing all night. Such nice guys also, and so personable. Cannot recommend them highly enough." The three guys are incredible musicians. My new wife's family are big into their music and they were thrilled, along with all of our guests with the set played. They are so energetic and really got the crowd going. They are incredibly talented and their song mash-ups are brilliant. The guys played our first dance song (On Top Of The World by Imagine Dragons) for us and even sent us a video of them practicing it a few weeks before so we could practice. They dance floor was packed. The energy the guys bring is amazing and they were all anyone could talk about the next morning. Roly stayed on to play a DJ set late into the night and it was also top class. We had sent a Spotify playlist of the type of music we like and he picked a set of crackers. The guys were amazing, they had everyone dancing non stop. They playes our first dance song and it was beautiful. It was like a festival. At one point I had to change my shirt nexus I'd been dancing so long. Amazing would highly recommend. Worth every penny. 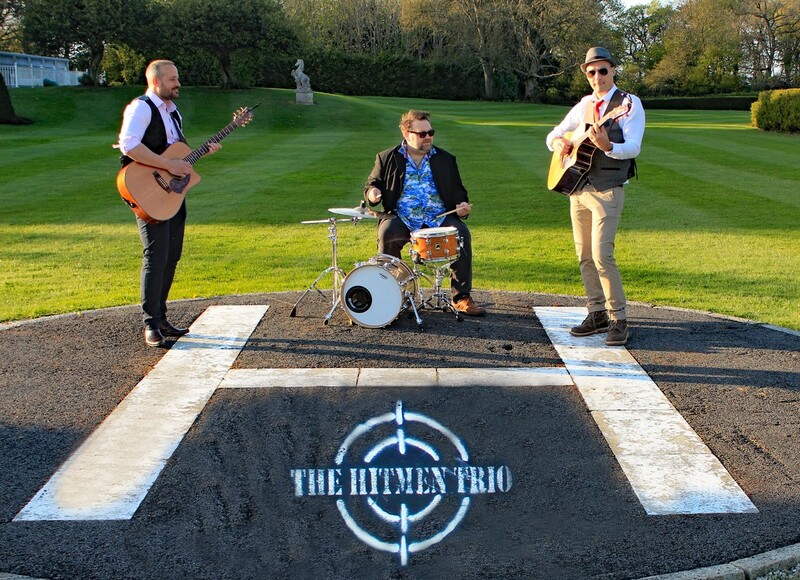 Apart from getting married they were the highlight of the day We can't recommend highly enough the Hitmen Trio. The lads put on such an energetic and memorable show for us and our guests. There was a large crowd all night up dancing and enjoying the great songs they played. From day one dealing with them, they were very accommodating and had no problem with any of our requests (I ask them to play a specific song about a week before the wedding) . These guys are truly AMAZING. They made our wedding. They're excellent musicians who bring energy, originality and enthusiasm. The dance floor was packed from the first song until the DJ (also provided by them) finished. Everyone was raving about them and one of the bridesmaids actually booked them on the night for their own wedding. I can't thank and praise the Hitmen Trio more, Thank you, thank you, thank you. From the get go, you were all so helpful with music suggestions, and even agreeing to learn our first dance! 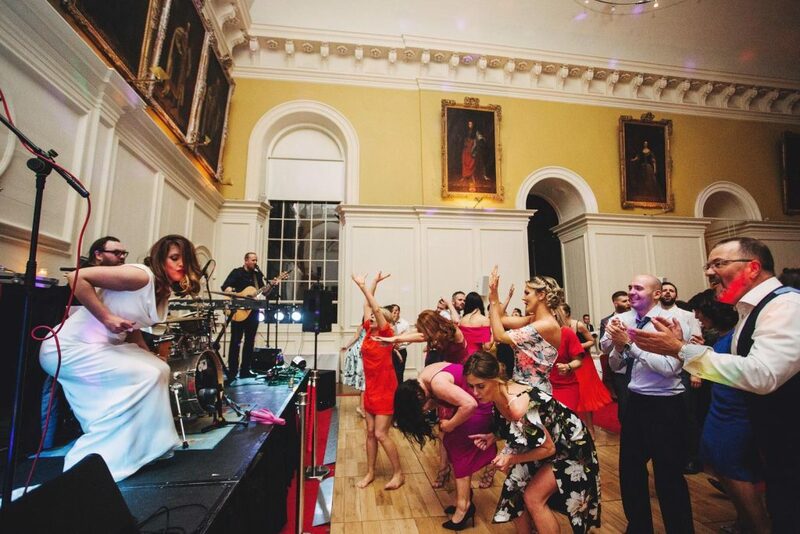 Your are supreme professionals, the day ran so smoothly, from ceremony, right through to the DJ - having The Hitmen Trio do the lot was the best decision we made. Wedding Couples’ First Dance Songs The wedding couples’ first dance is often the highlight of the reception, and the choice of song is very important.